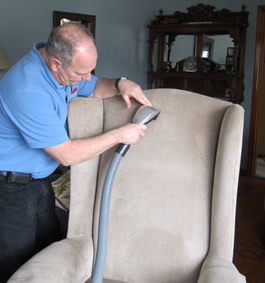 Carpet Wizard has been cleaning upholstery for over 30 years, as long as we have been cleaning carpets. Just about all types of fabric can be safely cleaned. Fine fabrics such as cotton and silk are often mistaken as impossible to clean. This is not true. These fabrics can last a life time if cleaned on a regular basis. Oils from the skin and hair are often what lead to the loss of the finish on your fabric making it look dull over time. We recommend cleaning your furniture at least every 2 years to retain its like new condition, or more frequently depending on the situation. We can clean couches, chairs, cushions, ottomans or anything upholstered in just about any type of fabric, including leather.